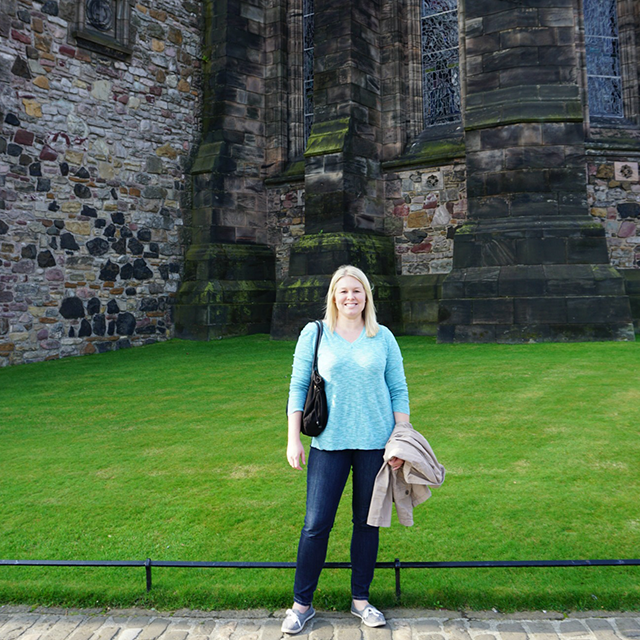 Lifestyle blogger Sam from Away She Went recently returned from a trip across the pond. 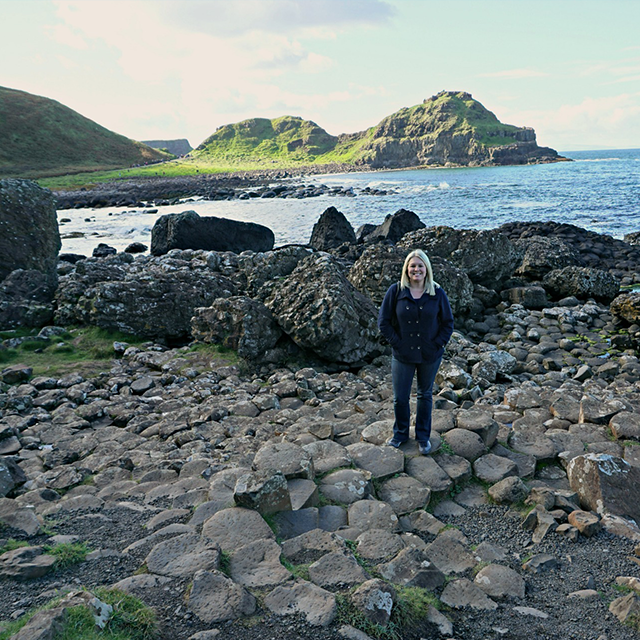 While Scotland and Ireland are always crowd-pleasers, Sam was pleasantly surprised to discover that her favorite stop during the 15-day trip was scenic Northern Ireland. 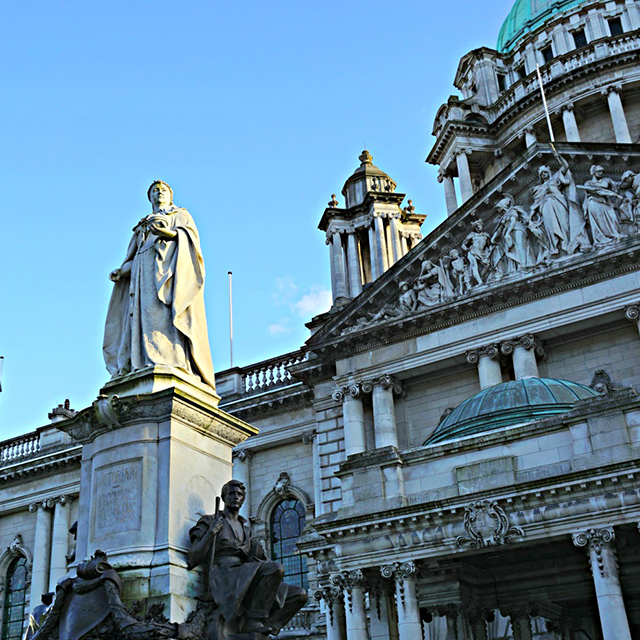 Read on for her recap of the Northern Ireland itinerary and learn why she loved Belfast and the surrounding countryside. When we originally booked our Landscapes of Scotland & Ireland tour, I was the least excited about the two days planned in Northern Ireland. I didn’t know much about the area other than its turbulent history (“the Troubles”) and that it’s one of the filming locations for Game of Thrones. I’m a huge Game of Thrones fan, so that part was exciting, but I was feeling pretty meh about the rest of our time in Belfast. Now here’s where I admit that I was completely wrong. Northern Ireland is amazing! Belfast ended up being one of my favorite cities and the excursion to the Giant’s Causeway was the highlight of our trip! We arrived in Belfast via the ferry from Scotland. Our Tour Director suggested switching up the itinerary and recommended that we visit the Titanic Belfast museum the afternoon of our arrival instead of the following day, so off we went to Titanic Belfast. 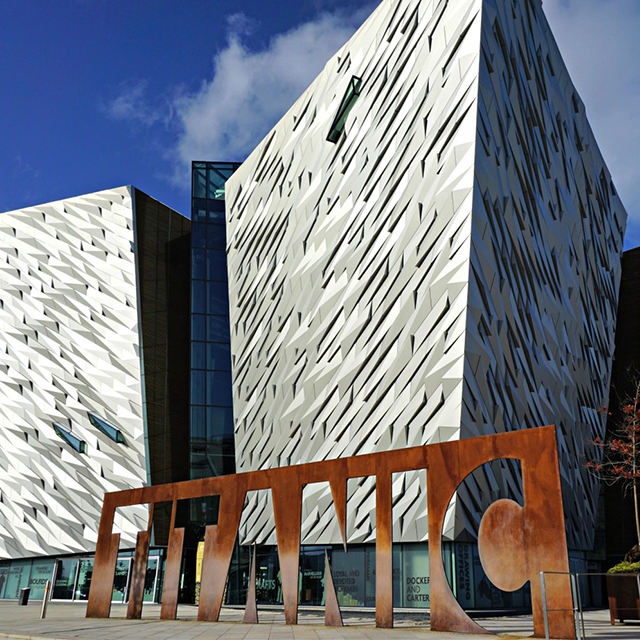 Titanic Belfast was built in 2012 to mark 100 years since the Titanic’s maiden voyage. It’s located in the former shipyard area where the RMS Titanic was built (now known as the city’s Titanic Quarter). The exhibition is made up of interactive galleries detailing the history of Belfast and the Titanic. The exhibition starts with Belfast at the beginning of the 20th century and works its way through the building of the Titanic (there’s even a ride!) to the launch of the ship, the sinking, and the aftermath. The exhibition is well done and it’s almost impossible to get through without getting a little teary. The stories of some of the passengers are featured throughout the exhibition. In the first couple galleries you learn a little about the person and why they were sailing. Towards the end of the exhibition you find out their fate and of course, most of them did not survive. The exhibition also talks about how the sinking affected the people of Belfast. The workers literally put their blood, sweat, and tears into building that ship, so the sinking of the Titanic was devastating news for the entire city. My mom and I had some extra time after we finished exploring the exhibit, so we walked over to Titanic Studios (where Game of Thrones is filmed) to see if we could get a sneak peek at anything. Of course everything was fenced off, so we could only see the giant green screen through the large open doors. From there we checked into our hotel and enjoyed a group dinner together at the hotel restaurant. The following day we took a bus tour around the city with a local guide. Our guide gave us a brief history of Belfast, explained the Troubles, and shared what it was like to live in Belfast during that time. A peace agreement was signed in 1998, so it’s now 20 years later and there’s a whole new generation of people removed from the conflict. Our guide told us that Belfast is experiencing a renaissance with new businesses and restaurants opening around the city. 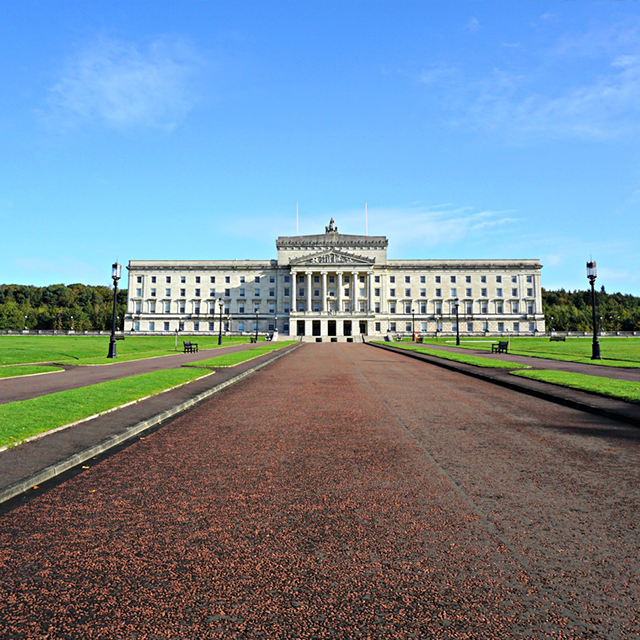 During our tour we made a quick stop at The Queen’s University of Belfast, viewed some of the murals and street art, walked along the peace wall, and visited the grounds of the Parliament Buildings, the seat of the Northern Ireland Assembly. My favorite details from the Parliament Buildings were the moose head street lamps (they were a gift from Canada). We only had time for a quick overview of the city, but hopefully I’ll make it back someday so I can enjoy Belfast even more. After the city tour we hopped back on the bus for our excursion to the Giant’s Causeway. The Giant’s Causeway is located on the northern coast and the drive up there is so beautiful. I’m from Arizona, so all of the green grass everywhere was a completely different landscape than I’m used to. The weather was perfect that day too, so the views were stunning. The Giant’s Causeway is a UNESCO World Heritage site located at the foot of the basalt cliffs along the sea coast. 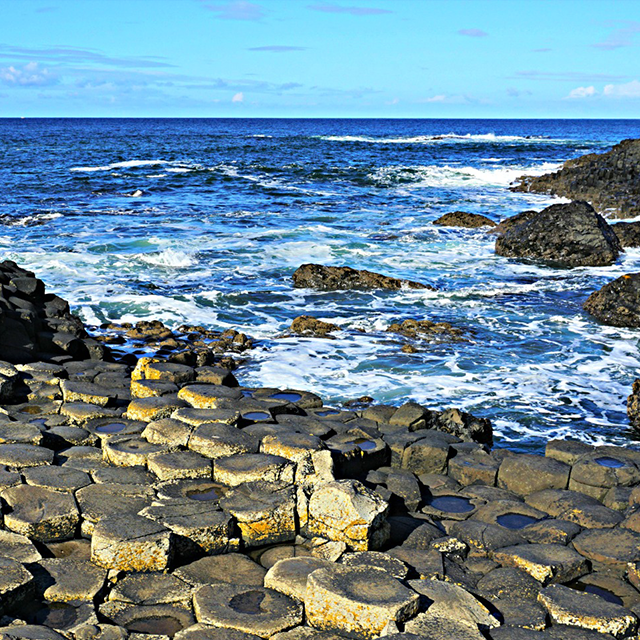 It’s made up of 40,000 interlocking basalt columns sticking out of the sea. The columns were formed from the cooling and contracting of volcanic lava. The columns are shaped into almost perfect hexagons. It’s a pretty crazy sight! Legend says that the giant Finn McCool threw the columns into the sea to make a path to Scotland so he could fight another giant. The visitor’s center even has a short cartoon about Finn McCool playing in the lobby. Honestly, with the way the columns are so perfectly shaped and laid out along the coast, a crazy story about giants doesn’t seem so far-fetched. After our visit to the Giant’s Causeway we took the scenic route back to Belfast (although I feel like every route there is scenic). The weather was so clear that day we were able to stop for a great view of Carrick-a-Rede Rope Bridge and mainland Scotland off in the distance. Once we arrived back in Belfast we spent the rest of the afternoon walking around City Hall and of course, we did some shopping. It was a quick two days in Northern Ireland, but it was long enough to fall in love with the country. Hopefully I’ll make it back some day so I can explore more of Belfast and the surrounding areas. Want to read more? Check out Sam’s travel recaps from her Italy tour here. 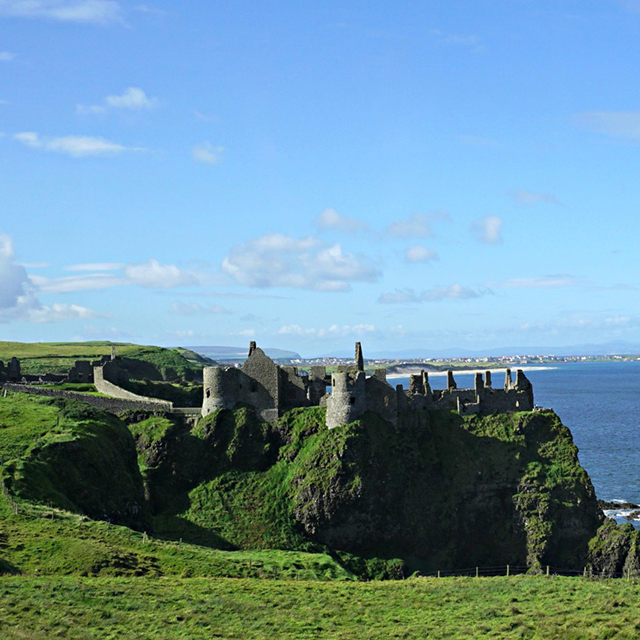 Have you ever been to Northern Ireland? What was your favorite part?